It’s been a while since I’ve done a Twofer Tuesday shout-out to some of my favorite reads, so this week’s includes a giveaway of both books! This summer, I read two YA debuts that I loved and want to share with other readers. 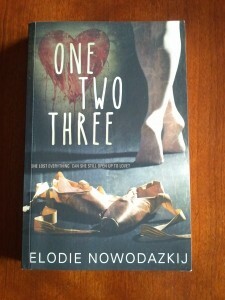 ONE, TWO, THREE by Elodie Nowadazkij is a contemporary novel with equal parts of ballet, romance, and friendship. I first read a draft of this novel when it was a wee baby, and I can’t even begin to express how impressed I am with the final product. Elodie decided to self-publish this book, and spent so much time and effort making it shine. Natalya has to deal with the dark side of dance when she’s plagued by an injury–every dancer’s worst nightmare. This struggle is the perfect counterpoint to Nata’s budding–and difficult–romance with Tonio, a passionate soccer player trying to break free from alcohol. Fans of the performing arts will love this story! 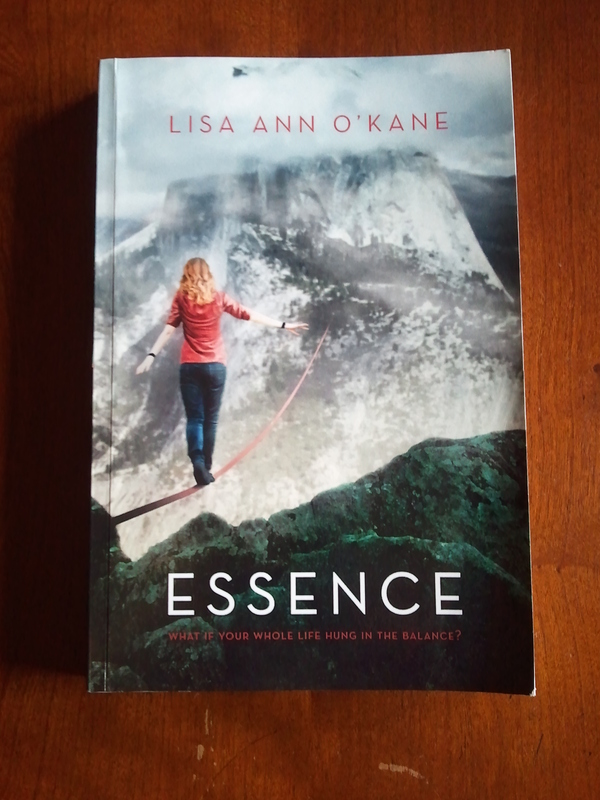 ESSENCE by Lisa Ann O’Kane was published by Strange Chemistry right before they made the decision to shut down operations. I for one was thrilled to be able to at least get the chance to read Autumn’s gripping story as she navigated her futuristic post-cult world by falling into another cult. Mental and physical challenges await Autumn as she learns to slackline (you’ll want to read about this!) and decides whom to trust. A great read for armchair thrill-seekers! Just comment below to win one of these incredible books. US only, please! Also, these stories are quite different, so if you have a preference, please note which one you’d like in the comments, and I’ll put your name in the appropriate hat. If you’re excited by both, that’s cool, too. Into both hats you go! Twofer Tuesday: ARCS from NCTE! Though I didn’t attend the recent NCTE (National Council of Teachers of English) conference in Boston, I had a ton of fun at the Great NCTE Kids/YA Lit Tweetup on Friday night at the Trident. It was great seeing old friends, including most of my Boston Writers’ (aka Crêpe-eaters’) group, as well as chatting with people I knew online but had never met, and those I’d never even knew of before. Besides talking about writing projects with others, one of the most exciting things to discuss were the new ARCs (Advance Reading Copy) out at the conference. I wound up with two wonderful ARCs and am happy to report that they were both amazing! SEVEN WILD SISTERS by Charles de Lint is a companion novel to THE CATS OF TANGLEWOOD FOREST, which I haven’t yet read, but I definitely want to get it after reading this one. SEVEN WILD SISTERS captured my attention as a “modern fairy tale,” and it did not disappoint. My six-year-old twin daughters have been reading the books in the “Rainbow Fairies” series, which are fine, but I wanted to present them with some fairy stories that have more of a literary bent, and we plowed through this one (with me reading out loud). Sarah Jane’s adventurous spirit drew us all in and her plucky resolve carried us through the story. Most of all, as a mom trying to protect and nurture my girls’ belief in magic, I was amazed how captivated my little sprites were by the little details that came to life on the page. What a lovely book! Anyone else snag an NCTE ARC that was particularly delicious? Please tell! Time for another twofer set of book recommendations! First, a caveat: pretty much the only thing these two books have in common was that I could not put them down. Well, and the reason that I couldn’t put them down was that I cared so much about the characters from the very beginning and wanted–no, needed–to know what would happen to them. ALL THE TRUTH THAT’S IN ME by Julie Berry. This book! First off, the striking cover art really grabbed my attention. I had to know what a book that looks like this could be about. Tonight the moon came out, and I went out with it, to watch it rise over the treetops. So silent, the moon. FAIR COIN by E.C. Myers. Again, this book could not be more different. While ALL THE TRUTH THAT’S IN ME delves into a world in the past, FAIR COIN thrusts us into a near-future that makes the reader wonder if the unfolding story is in fact science fiction or fantasy. Is there a scientific reason driving the “wishes” that seem to be changing sixteen-year-old Ephraim’s life, or is there magic behind it? Ephraim had stayed late, hoping for a chance to talk to Jena Kim, the hottest geek girl in his class, while his mother nearly killed herself. Looking forward to reading QUANTUM COIN! For the uninitiated, “comp titles,” or “comparison titles” are titles of books that you or your publisher think are similar to your manuscript in some way. For a couple of great posts on comp titles, check out this post on Pimp My Novel and this post on Taryn Albright’s blog. I’m always on the lookout for comp titles–partially because I like to read what I like to write, but also because I don’t want to suffer the agony of finding an already-published book just like mine out there after putting all the effort into it. I recently read two great comp titles. They couldn’t be more different from each other, but that’s fine because they’e for two different manuscripts. One is a comp for my completed ms I’m shopping (see Currently Querying) and the other is a comp for my current WIP (see this blog post). The idea of the first book, a YA novel called RADIANT DAYS by Elizabeth Hand, captured my attention before I even read it. An art student in the 1970s whose life intersects with 19th Century poet Arthur Rimbaud? Yes, please! I closed my eyes, and for the first time realized how a poem might be like a painting, each word a brushstroke, a color or flash of motion: words combined the way I mixed pigments, or slashed a sun across a wall in arcs of neon below. Another brilliant character in the manuscript is the vagrant fishing at the edge of the river on both character’s worlds–an Orpheus-like character whose presence brings Merle and Rimbaud together. Merle, who’s lost her home, her girlfriend, and her collection of sketches, doesn’t know where to begin again since she’s lost everything. The vagrant’s response? The second didn’t really end up being a comp title after all, but I had to read it to find out–and I’m glad I did. VOICES by Arnaldur Indridason is a police thriller for adults set in Iceland. Basically, a thriller set in Iceland? My kind of book. It was a total page-turner, but was set in a hotel in Reykjavík and didn’t have the MC getting out all that much. However, it was pretty cool to see all the awesome Icelandic names and drool over the buffet meals. He walked past the table and admired the herring, smoked lamb, cold ham, ox tongue and all the trimmings, and the delicious desserts, ice cream, cream cakes and chocolate mousse, or whatever it was. While it didn’t turn out to be a comp title for me, it’s always great to read a master at setting up mystery and suspense. We weren’t sure until the end who had committed the murder in the first chapter–tons of twists and red herrings. And lots of cool woolen sweaters. I read a lot, and what makes me love a book more than anything else is beautiful writing. I’d be the type of agent (if I were ever an agent, which I wouldn’t be) who’s ask for literary, lyrical novels. The kind of novel that knocks me over with that type of prose is rare, and when I find one, I just want to hold it and savor each delicious word. Unbelievably, I came across not one but two such novels (both debuts) in the past few weeks and I feel compelled to recommend them: RULES OF CIVILITY by Amor Towles and THE GIRL WITH BORROWED WINGS by Rinsai Rossetti. For what was civilization but the intellect’s ascendancy out of the doldrums of necessity (shelter, sustenance and survival) into the ether or the finely superfluous (poetry, handbags and haute cuisine)? The entire book is this beautiful. The. Entire. Book. But having him beside me, with my father’s itch clawing into my back, my fingers shaky because of what I had just put them through, and things beating to and fro, in one direction then another, inside of me, was already more than I could stand. Can you even stand waiting for more? I devoured this book in one sitting. I’m already looking forward to more books from both of these authors and in the meantime, these books have edged their way into my short list of favorite books of all time. It’s been a pretty good month to be a reader. 🙂 Hope you enjoy them, too! For anyone who missed my last Twofer Tuesday on two great Tudor YA novels, I’ve started up a Twofer Tuesday blog series on two books I’ve read and can’t wait to recommend. Up this week: two Middle Grade novels that had me in tears by the end. Trust me–this is a good thing. I adore a book that makes me cry. While the vast majority of books I read are YA, I read a good share of MG novels this summer. Without a doubt, my two favorites were FLYING THE DRAGON by Natalie Dias Lorenzi and ONE FOR THE MURPHYS by Lynda Mullaly Hunt. Both of these novels are about the characters fitting in when they find themselves in almost unimaginably difficult situations, and both authors did a remarkable job making us care so much about them that their pain becomes our pain. In FLYING THE DRAGON, Hiroshi must leave his native Japan behind to move to America with his parents and grandfather, who needs treatment for cancer not available in Japan. But Hiroshi isn’t the only one who has to make sacrifices. His cousin Skye must serve as his interpreter in school and spend her Saturdays in Japanese school instead of soccer practice as she tries to get to know the grandfather Hiroshi’s known his whole life–before it’s too late. Carley in ONE FOR THE MURPHYS also must leave her home behind after an incident sends her to a hospital and then a foster home–while her mom still recovers in the hospital. As Carley struggles to fit in with her new family and new best friend, she comes to realize how much she loves her new life. At the same time, she must acknowledge her feelings about her less-than-perfect mom–which get all the more complicated as her memories of the incident return. I’d love to hear about more recommendations for other tissue-worthy MG reads. In the meantime, hope you love these books as much as I did. But keep the tissues handy when you read them! Welcome to my new blog series! I’m starting this to introduce some great sets of twofers: two books I’ve read and want to recommend. I got the idea for this series when I recently finished two great Tudor-themed YA novels: GILT by Katherine Longshore and TRANSCENDENCE by C.J. Omololu. On the one hand, these books couldn’t be more different (details below), but I loved them both for different reasons, so anyone else fascinated with that time period will probably love them, too! GILT is historical fiction at its best. From the first page, I was pulled into the head of Kitty Tylney, best friend to Catherine Howard, the fifth of the infamous Henry VIII’s wives. The details of life at this time and place, the intrigue of the situation in which she finds herself, the conflicted loyalty she feels–WOW! I had to restrain myself from looking up the facts that formed the basis for this story in Alison Weir’s THE SIX WIVES OF HENRY VII until I finished. TRANSCENDENCE is a great contemporary YA that pulls us into different times and places with likewise vivid details, including recurring visits to the Tower of London in Tudor England. Main character Cole’s swoon-worthy romance with Griffon that spans lifetimes makes this book worthy of a read in itself, but when combined with the intriguing mystery Cole uncovers of a cello rival in her past–and present–I couldn’t pass the pages quickly enough. Any other great Tudor YA reads out there? I’d love to see some more recommendations to add to my TBR pile!